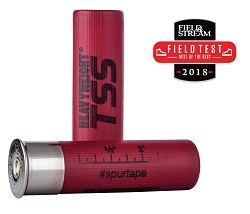 ANOKA, Minnesota - December 3, 2018 - Federal Ammunition is proud to announce its Premium HEAVYWEIGHT TSS turkey loads have been honored by Field & Stream as a 2018 Best of the Best product. This honor is featured in the December/January issue of the magazine, now available on newsstands. Federal Premium HEAVYWEIGHT TSS shotshells represent a big upgrade from anything previously available, letting hunters kill gobblers at longer distances than ever thought possible. Payloads of No. 7 or 9 Tungsten Super Shot provide extremely high pellet counts—in many cases, more than double those lead loads of the same weight. The shot’s 18 gram per cubic centimeter density provides optimum energy and the highest velocities at long ranges. The full-length, rear-braking FLITECONTROL FLEX wad protects the barrel as TSS travels down it. The wad also provides the tightest, most consistent patterns possible through ported and standard choke tubes, maximizing the number of pellets in a 10-inch circle at 40 yards. The shells come in five-count packs, and a portion of all proceeds is donated to the National Wild Turkey Federation. For more information on Federal Ammunition, visit www.federalpremium.com..